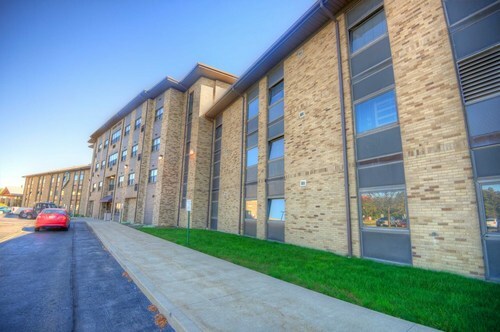 Menard Hall was Walsh University's first residence hall facility; built in 1966, it was named after Brother Patrick Menard. Consisting of first, second, and third year traditional-aged college students, Menard Hall provides daily interaction with students with varied college experience. This hall is also home to our Pre-Nursing Living-Learning Community. Entry into Menard Hall is gained by a secure card swipe using your student ID. Only students living in your building are able to enter, while any guests must be escorted within yourresidence hall at all times. **Conveniences such as a microwave and mini-fridge must be provided by you and your roommates. Layout: All rooms are 19' x 9' x 9'. View the Menard Hall Floor Plan. Each room is ready for your personal touch! Furniture can be arranged however you choose. Try it out here: Arrange Your Menard Hall Room. Co-ed: Yes. Single-gender by floor. Meal Plan: Full meal plan required. Campus life is a unique part of your college experience! Living in a residence hall offers students the opportunity to develop life skills and create life-long friends and memories. Still not sure if Menard Hall is the residence hall for you? Take a tour. Menard Hall is represented by “C” on this Walsh University Campus Map. View Menard Hall housing rates.